I read a book last week that has me thinking a lot about my decorating style. One of my goals for this year is to refine the decor in our home and edit every room to only contain things that we really love. But lately I’ve been wondering what my style really is. I appreciate a lot of styles and that makes it tough to figure out what I want in my own home and what I just love in pictures of someone else’s home. This post contains affiliate links. See my disclosure for information. 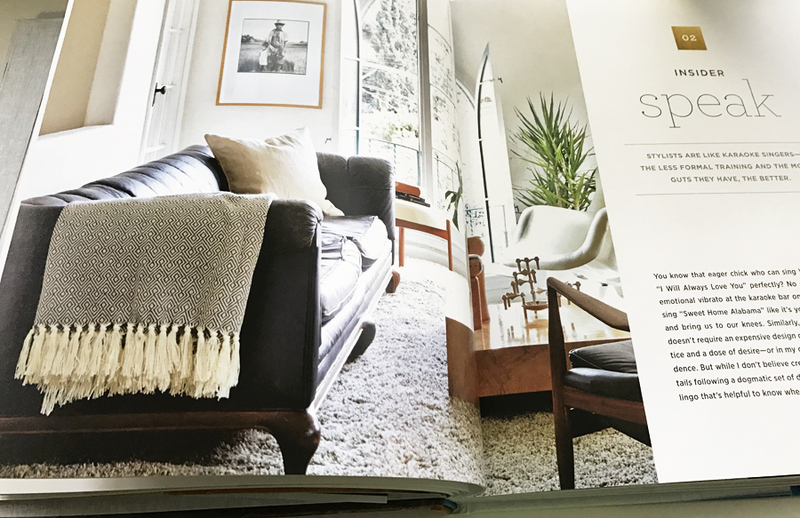 I picked up a book last week called Styled: Secrets for Arranging Rooms, from Tabletops to Bookshelves and it was very helpful! 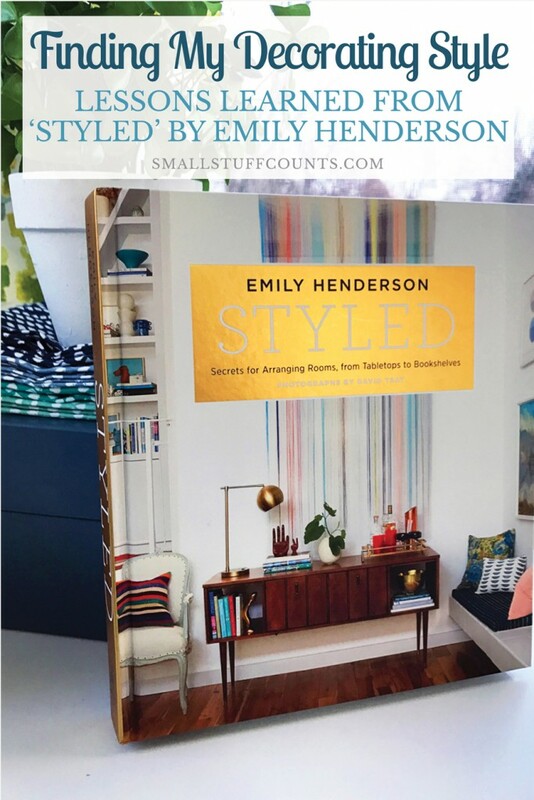 The author is Emily Henderson, who you may know from HGTV. 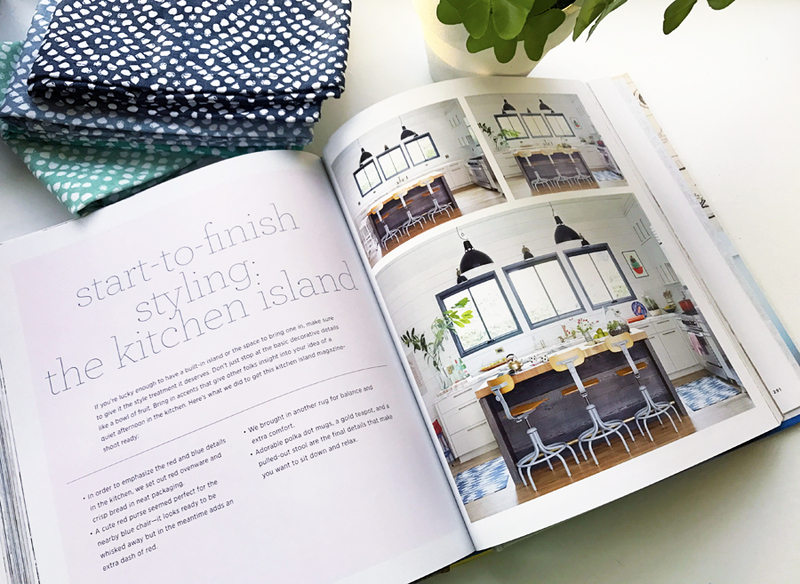 The interior stylist’s book is jam packed with tips for finding your style and creating a home you love. I was hoping to find some good tips in this book, but more than anything I was counting on it being a pretty coffee table book with its hard cover and photo-filled pages. I was not prepared for it to be so good that I couldn’t put the book down. I poured through all 300 pages in the first two days, soaking in every word and studying every image. There were so many aha moments while reading that got me thinking about my personal style and how I want my home to feel. I’ve wanted to put a name to my style for a long time, but never really known what it is. I feel like I’ve spent the past two years fixing up our first house and discovering my style. And while our house looks a lot prettier than it did when we first moved in, I’m now craving time to work my way back through it and make sure every single thing is well curated and intentional. As I mentioned in my home goals post a couple weeks ago, I want to refine the look of each room this year. I feel like my style has become more focused the more I’ve worked on our house, and some of the decorating I did early on doesn’t really feel like me anymore. And while I know I will always be evolving stylistically, I’m on a mission to refine the look of our home and truly style each space this year. 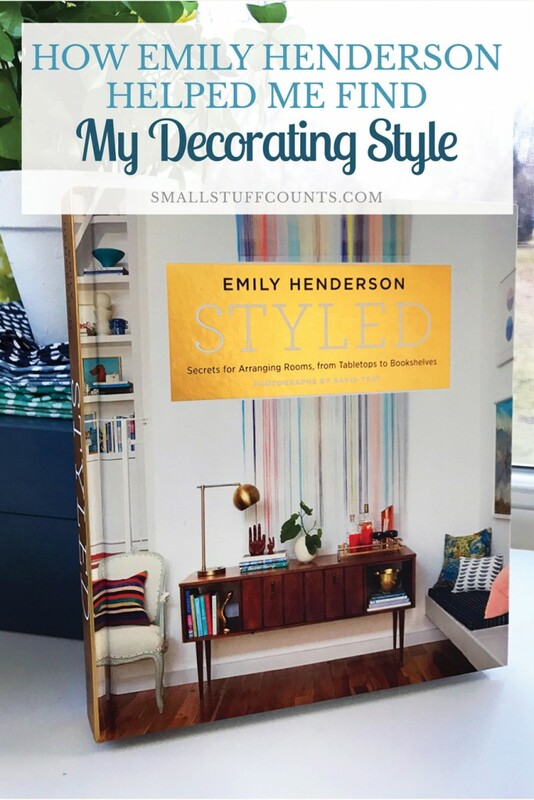 Emily’s book Styled: Secrets for Arranging Rooms, from Tabletops to Bookshelves is basically every single ounce of her styling genius packaged up into one book. I expected to flip through the book mainly for the pictures, but it was so good that I read it cover to cover. I have a natural eye for what looks good in a room, but I don’t know a ton about professional design concepts and approaches. It was helpful to learn about interior styling from an actual stylist. 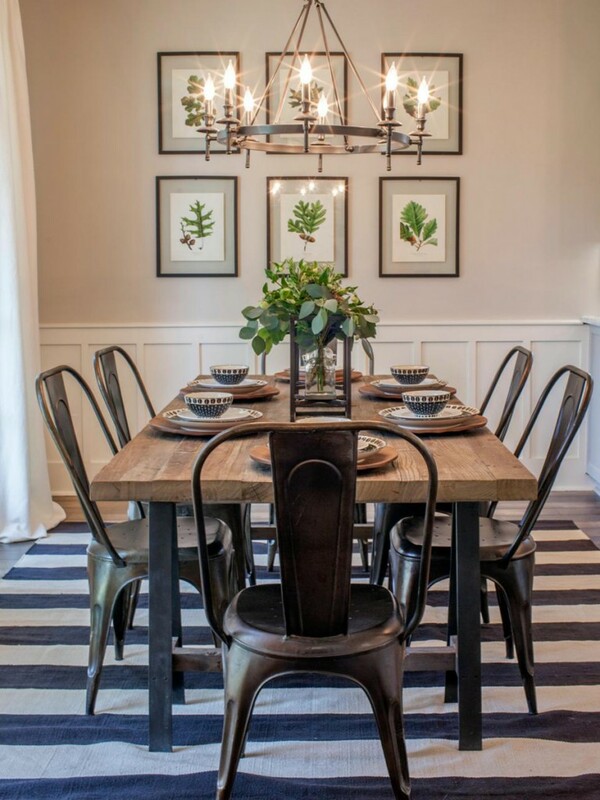 Styling is about working with what you have, not redecorating from top to bottom. 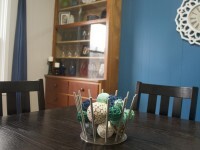 Emily is quick to point out the differences between a stylist and an interior designer. Styling is all about rearranging what you have to create the vibe you’re after. It’s more low key and approachable, unlike interior design which is often focused on the larger things like replacing all the furniture and knocking down walls. 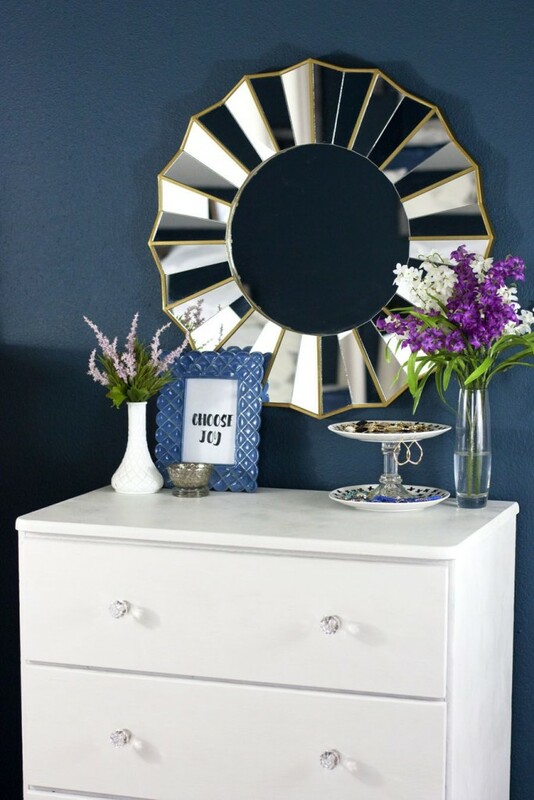 Going through your house and gathering up the decor you love is the first step to styling, then you can go shopping later to fill in the gaps and complete the look. I definitely agree with this concept of using what you have rather than trying to buy everything new at the same time. You need to get to know what you love before you can style your space. 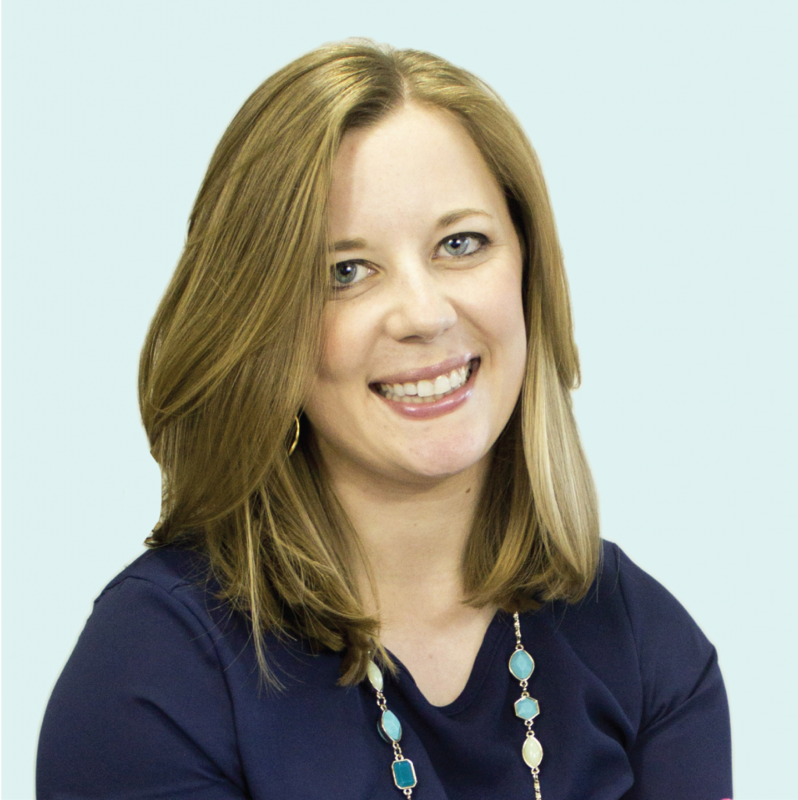 Emily says it’s important to define your style because it will help your home feel more like you than ever before, you’ll be a better shopper and you’ll be able to easily edit the things in your home. The book’s style quiz helps you figure out your interior design style, ranging from Minamalist and Mid-Century Modern to Bohemian and Traditional. The quiz told me my style is Scandinavian, with Minamalist as a close second. This surprised me since those are words I would never use to describe my style, but I understood why I’d land in those categories once I read the descriptions and looked at examples. In looking around my home at my favorite rooms and vignettes, I definitely see a heavy Scandinavian influence even though I didn’t realize that was a thing at the time I was decorating. Some of my Scandinavian tendencies include a lot of neutrals with hits of black, texture, wood tones and occasonal touches of color. I am drawn to these things, but I will say this style scews toward more modern furniture than I care for. Mixing decorating styles is encouraged. This lesson was huge for me! It’s been bugging me that I don’t have a particular defined style, but Emily advocates for mixing many styles. She says different style influences within a room makes it interesting. I thought this tip was really helpful because there were elements of many other styles in the book that I was drawn to. So while it’s helpful to know your style, the more important thing to note is that it’s your unique style. She does recommend unifying contrasting styles with a cohesive color palette. The best rooms have a combination of old and new. 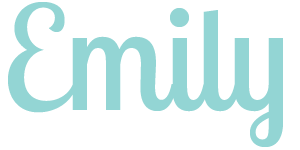 Emily loves shopping at flea markets and thrift stores, which I admire! 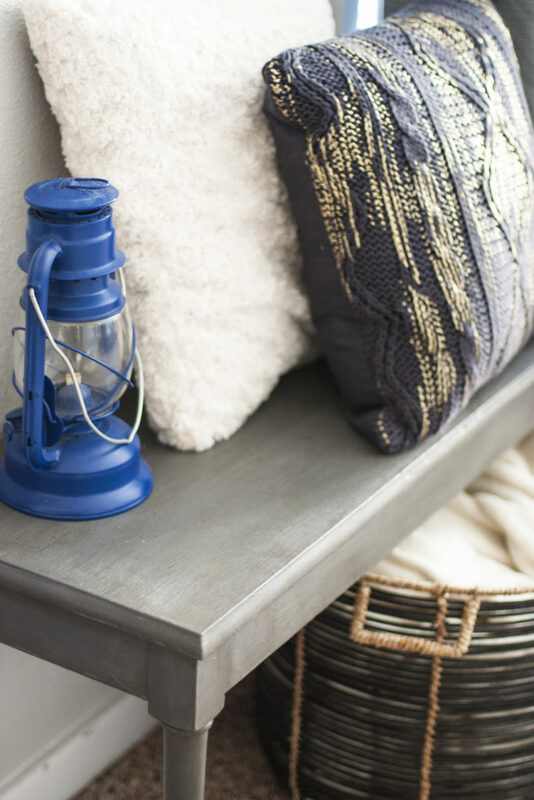 I’ve always enjoyed the hunt for interesting decor and the challenge of fixing up or repurposing my finds. Incorporating vintage and antique items will make a room feel collected and original, unlike if your whole space was furnished with mass produced items from the big box store. I feel like Emily gave me permission to do more thrifting, which is totally fine by me ;). I was feeling so inspired that I looked up this year’s dates for a couple of the big flea markets around here and literally put those weekends on my calendar. Now can spring get here already so I can go to one? 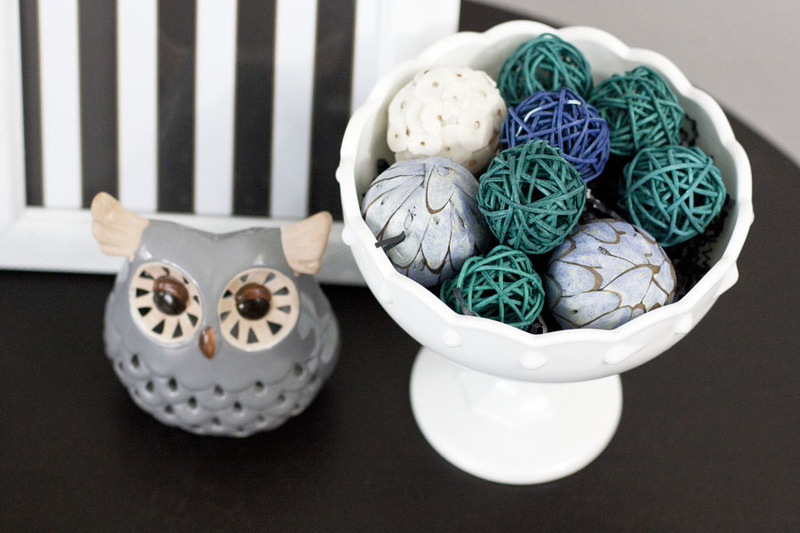 Add something quirky and unexpected to every room. 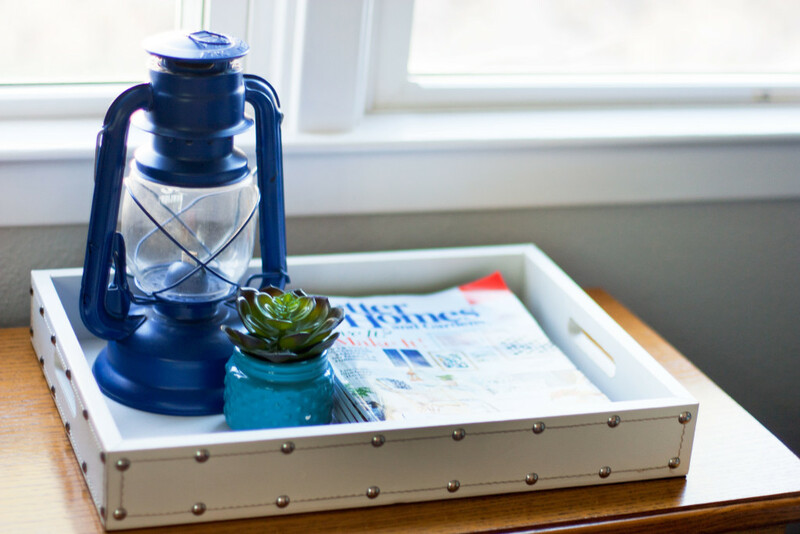 Every room needs something random or quirky to keep the room real, rather than looking magazine-perfect. This doesn’t necessarily mean it has to be wild (unless you want it to), but it should be interesting and out of the ordinary. I think I have some work to do to add more interesting elements to our home, things that tell a story and really jump out at people because they’re so unexpected. I thought this was really interesting! If you love color, Emily advises painting your walls white because then you can add all the colorful accessories you want without the room feeling too chaotic. 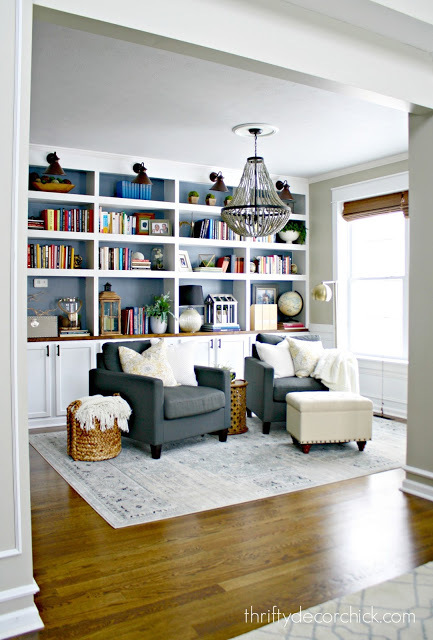 And if you gravitate toward more neutral, muted tones, she suggests using color in a bigger way like an accent wall or large rug to avoid having a boring beige room. Study photos and take notes. The bulk of the book is devoted to beautiful images of a large variety of styles of rooms, with Emily’s tips and commentary about each. 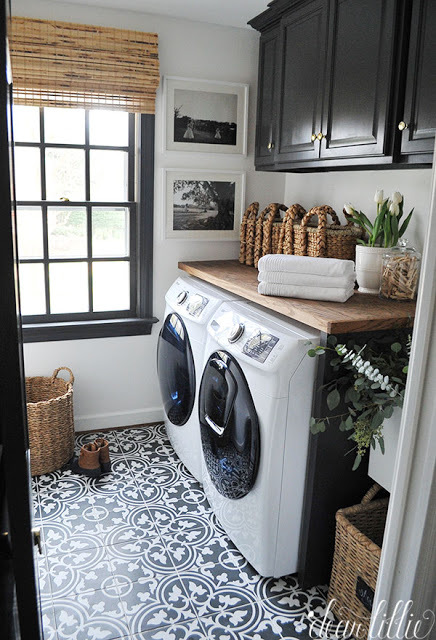 I found this section very helpful because she breaks down what works in each room and why. I realized there are a lot of styles that I’m not really exposed to, probably because I live in the Midwest and tend to follow people online with a similar style to mine. It was refreshing to look at so many different styles! In addition to studying photos of spaces you love, Emily also recommends taking photos of your own home and assessing them. She says it’s easier to step back and evaluate your room from a picture, so open it up on your computer and think of it like something you’d find on Pinterest or in a magazine. What do you like about it? What needs improvement? 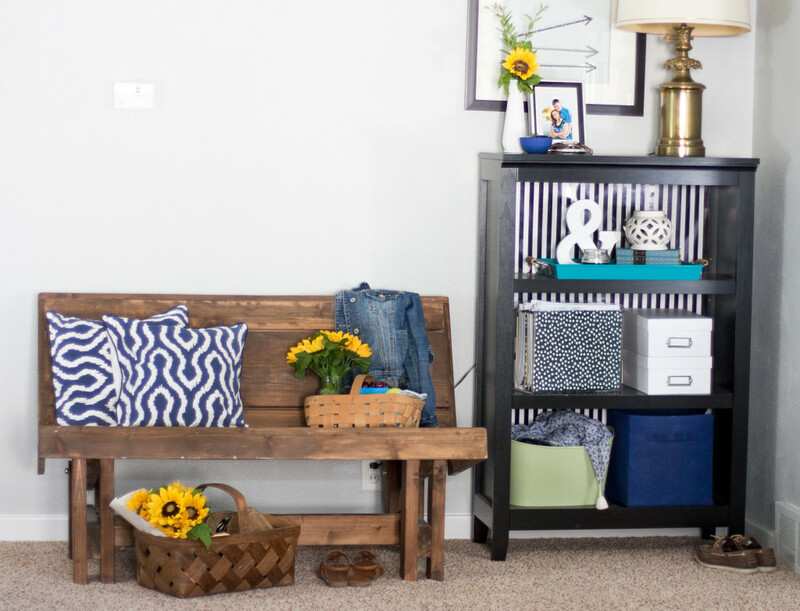 Make notes and then get to work on styling your room some more. When it feels done or you get stuck, take another picture and assess your progress. So did I find my decorating style? I’ve been having somewhat of an identity crisis with my decorating style lately. Parts of my house feel ‘right’, while others look okay but don’t really feel like me. As I mentioned, one of my goals for this year is to refine my style and incorporate it throughout our house. This book gave me some lightbulb moments that helped me realize what styles I like and dislike. It got me thinking about my own house a lot, and I’ve been gathering inspiration and making plans ever since reading it. At first, the style quiz felt like a weight was lifted off my shoulders. I now had actual terminology, a true name for my style that I’ve felt like I was missing. But the more I researched Scandinavian style, the more conflicted I became. I like a lot of Scandinavian elements, but not all especially all of the modern furniture. And there are so many other styles I like as well! How’s a girl to decide? After obsessing over coming up with an actual name to define my style for over a week now, I’ve come full circle. The book got me thinking and researching decorating styles which left me overwhelmed with inspiration and more confused than before. But as I’ve let my ideas and Emily’s advice marinate for a while, I’ve realized that my big takeaway from the book is that it’s okay to blend many different style. Basically, I bought this book in my quest to define my style. But after reading it, I’ve realized there’s no need to limit myself to a certain style at all. In fact, mixing styles and doing whatever you love is encouraged! With my words jotted down, I searched for rooms that embodied those qualities. Rooms that I would transplant into my home in a heartbeat. I pinned them all to a new secret board. In my search of rooms I love, I came across the term “Transitional,” which I found described as new and old, feminine and masculine, the art of mixing, and less color with more texture. I like that description a lot. It basically means I can take my favorite parts of many styles and combine them into something that’s Transitional, rather than totally modern or totally traditional or totally farmhouse. It’s an in between of sorts, which is very freeing. 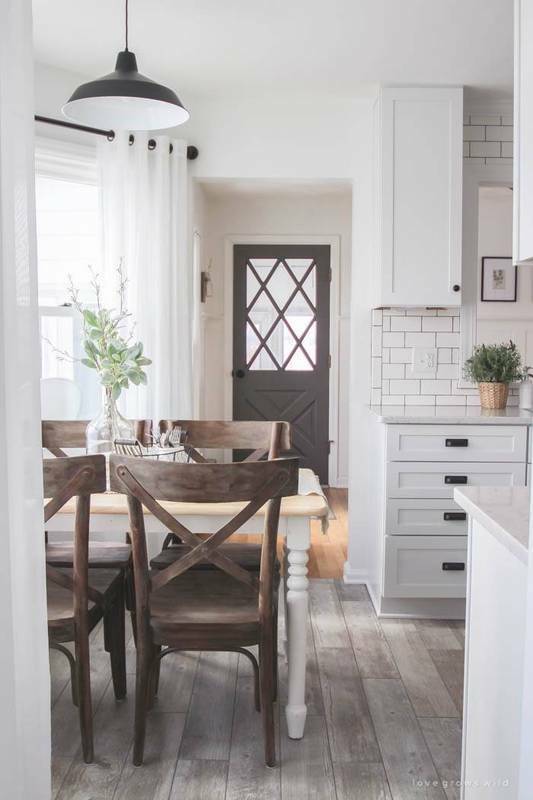 In addition to Transitional, some other more specific style names that resonated with me were Vintage Charm, Rustic Modern, Fresh Farmhouse, Modern Metro and Old World Charm. That’s quite the collection of styles, and I think my personal style is a blend of them all. So as for a style name, I still don’t really know! So while I’ve been wanting to put a specific name to it for so long, I’ve finally decided not to worry about it. Who cares what my style is called? All that really matters is how it feels. Clearly, this book got me thinking ;). And now I’m feeling inspired to edit each room and thoughtfully curate my decor. I can hardly wait. I couldn’t wait to get started and already have a couple new projects in progress! If you want to learn more about decorating or are in search of style inspiration, Styled is a fantastic book. I definitely recommend getting the hardcover version so you can use it to style your coffee table ;). How would you describe your style? I’d love to hear! « Casual Friday 01 – Puppies, A Book I Devoured, Favorite Podcast, Etc. So for now I’m looking for a mix of modern and traditional and some natural elements to keep everything fresh. It’s so hard to find your “style” on Pinterest, even though there’s so much inspiration out there. It did help me figure out what elements I like, just like you. There def needs to be some more “transitional” inspiration! Im totally over the farmhouse everything. lol I know that’s not my style, but thats what’s dominating Pinterest. Thanks for sharing this! That book has been on my wishlist! Hey Christene, so glad I’m not alone in the inability to figure out my decorating style! Agreed that farmhouse is getting old – I like components of it, but overall it’s just not my thing. Emily Henderson’s book is totally worth getting!